in the packing area and operates 24/7 without needing any computer to be switched on or manager present. SOLO2 comprises a choice of label printer and a small keypad with display the user keys a number to select a label to print. SOLO2 even takes care of the new requirements for the bolding of allergens in ingredients listings. 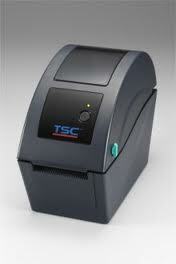 Labels can be plain white or supplied with a background printed with your company logo and colours. There is a choice of label printers to suit small labels and larger requirements without being limited by label size or shape or the amount of information needed on the labels. 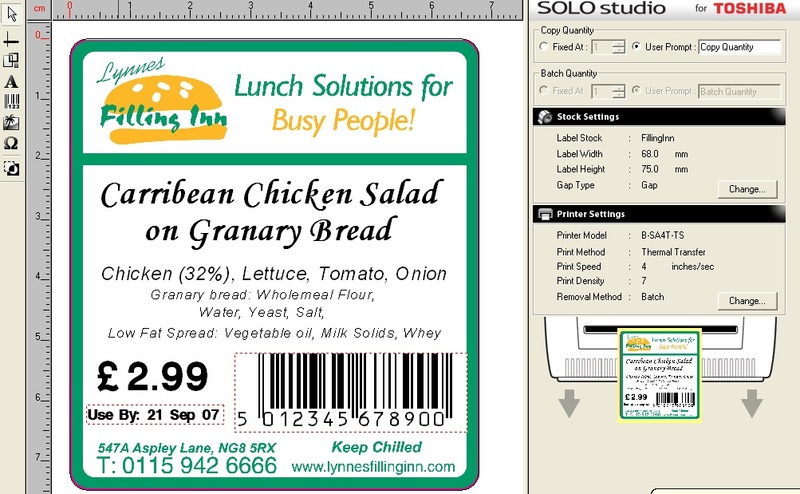 The SOLO2 system includes a ‘drag and drop’ PC computer based label designer that we use or you can use with a little training to arrange the positioning of the information blocks on the label and set up one or more labels ‘templates’ as well as linking the label templates to a product list that can be easily created and managed to add new products or change details at any time in say a Microsoft Excel Spreadsheet or simple text file. and replacing the above with real information about your products. This is not restricted to the example here you can add columns of information that will match up with and merge to the label information blocks at print time. When the operator keys a number to the keypad to select a product the information about that product is merged from the list onto the saved template label arrangement and printed. The user is asked for the quantity of label copies to be printed for the selected product if more that one copy is required. SOLO2 can be connected to a weighing scale to create SOLOWEIGH so that labels can be printed with the captured variable weight of the item from the scale along with the price per kilo from the product list and a calculated price per pack (then catch weight dependent). As with the standard SOLO2 a single finger is used key in a number to call up the product information before weighing, then the variable weight labelling can begin. A label is printed and ready peeled for attachment to each catch weight product as it is placed on the scale. As well as weight and calculated portion pack price you can also include information from other columns in your product list like ingredients, instructions, barcode, and storage information. For expiry dates they are automatically calculated since the SOLO2 contains a date / time clock and the date is automatically offset at the time of label printing by including a column in the product list to hold the stored ‘shelf life’ in days for each product and adding a prefix of ‘Best Before’ for say frozen goods or ‘Use By’ for more fresh items in front of the then offset printed expiry date. Let us know what size or shape you would like the label and if you would like plain or ready printed labels with you colour logo and contact details. The SOLO2 or SOLOWEIGH system will overprint the product details for all your products day to day with a single finger control and compact and not needing connection to a computer for normal operation.